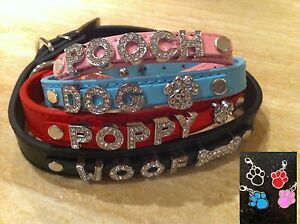 Details about GENUINE/REAL LEATHER CRYSTAL PERSONALISED DOG/PUPPY COLLAR/LEAD XS-XL-UK SELLER! GENUINE/REAL LEATHER CRYSTAL PERSONALISED DOG/PUPPY COLLAR/LEAD XS-XL-UK SELLER! GBP 0.95 postage for each additional eligible item you buy from poppyflower2012. There are 713 items available. Please enter a number less than or equal to 713. Immediate payment of GBP 6.99 is required.